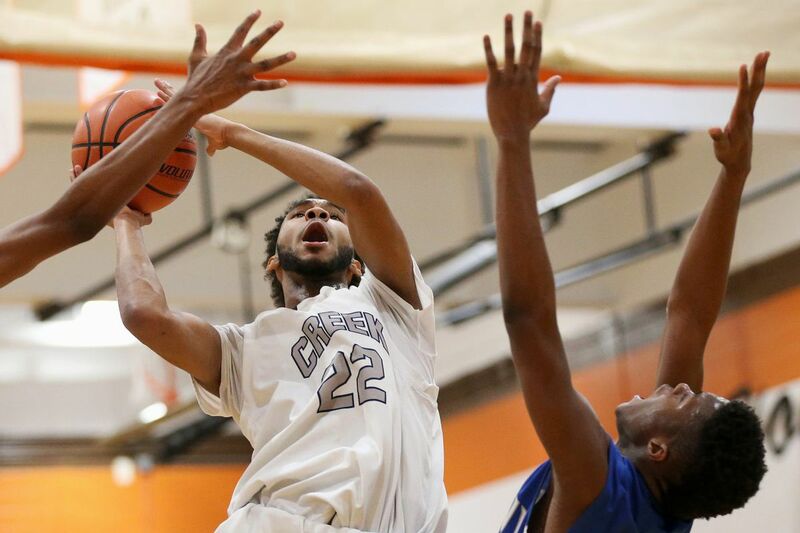 Timber Creek’s Maurice Murray will play in annual Carino Club senior all-star game March 25 at Rutgers-Camden. The rosters have been set for the annual Carino Club senior all-star boys' basketball game, scheduled for March 25 at Rutgers-Camden. In a twist, Timber Creek seniors Maurice Murray and Isaiah Sanders will play on opposing teams, as Murray will represent the White team and Sanders the Blue team. Isaiah Sanders of Timber Creek with dunk vs. Paul VI. Atlantic City’s Ray Bethea Jr. goes to the basket against Eastern’s Troy Edwards and Andrew Heck. Jared Latane became Haddon Heights all-time leading scorer during playoff win over Pleasantville. Camden’s Corey Greer was MVP of Play-by-Play Classic after the Panthers stunned Westtown, Pa.
Bishop Eustace Prep’s Peyton Vostenak battles for rebound with Paul VI’s Hartnel Haye. Triton’s Jalen Collins battles for rebound in playoff game at Seneca.